The South Korean conglomerate Lotte Group`s chairman Shin Dong-bin hopes Lotte`s eco smart city projects will become the best places to live in Viet Nam. Speaking at a meeting with the Prime Minister Nguyen Xuan Phuc on Tuesday, Lotte Group chairman said his visit to Viet Nam this year was to examine the progress of Lotte`s eco smart city projects in HCM City and Ha Noi. "The smart city projects will improve people`s living standards by providing them with access to spearhead technologies including Internet of Things (IoT), open platforms, cloud computing and environmental friendliness," said Shin. "The projects will help improve the cities` socio-economic growth, especially the Thu Thiem Lotte smart city would favour employing residents of Thu Thiem Commune," the Lotte Group chairman said, wishing the PM will join the project`s groundbreaking ceremony next year. 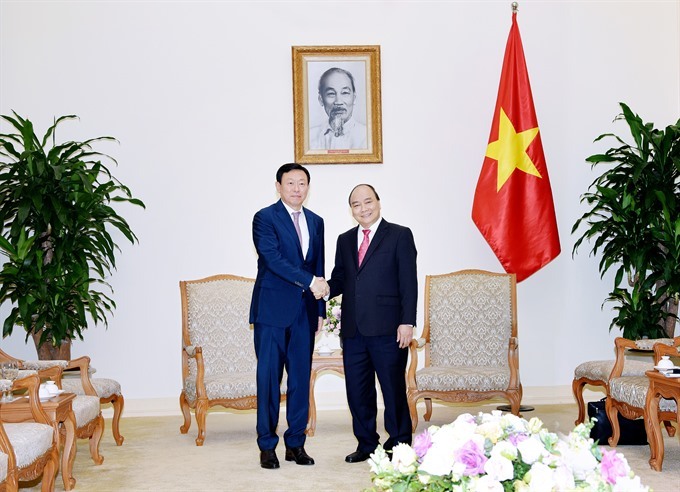 At the meeting, PM Phuc spoke highly of Lotte Group`s operations in Viet Nam and expected Lotte, with other South Korean firms in Viet Nam, would help foster the strategic partnership between the two nations. Lotte Group chairman Shin Dong-bin acknowledged PM Phuc`s concern over exporting Viet Nam`s agricultural and farming products to overseas markets. "Viet Nam`s export products have been displayed at all stores and supermarkets in South Korea since 2011 and they will be officially allowed for sale next April under the co-operation between Ha Noi and Lotte Mart South Korea," Shin said. "Since 2008, the Lotte Scholarship Foundation has given scholarships to more than 1,800 Vietnamese students. With Silicon Valley Vietnam and the Ministry of Science and Technology, it is implementing the Lotte Accelerator project to support outstanding start-up projects," Shin said. There are now 3,000 start-up projects in Viet Nam and 100 of them have received huge investment from overseas investors, according to PM Phuc. He also asked Lotte Group to quickly establish a start-up foundation for young Vietnamese people. According to the Lotte Group chairman, the bilateral relationship between Viet Nam and South Korea is now at its best. The South Korean government has granted long-term visas for Vietnamese travellers - the first in Asia - promising further co-operation between the two countries.